I made the mistake of letting Anna into my sewing room the other day whilst I was trying to trace some Burda patterns. I say mistake because she proceeded to pull fabrics from the stash for me to make into dresses for her, in the process messing up my newly folded fabric shelves. That child leaves a trail of destruction wherever she goes! I used New Look 6745, a now OOP pattern that I also picked up in an op shop. I made version D, the long sleeved version, although I left off the ruffle around the bottom out of sheer laziness. Of course after Anna spied the pattern she demanded a dress just like the little girl in the top picture with a ruffle around the bottom, so you may see another version of this dress again soon. The pattern is super simple and surprisingly the sizing was spot on. I made a size 4 for Anna even though it was a bit bigger than her measurements, so that she could layer it over some undershirts for when it's really cold, and hopefully wear it next year too. It doesn't look too big on her now, although I'm not sure that height wise she'll be able to wear it as a dress next year. The only change I made was to fully line the bodice in a bright pink cotton poplin instead of fiddling about with bias tape for the neckline. What I really like about this dress is that it buttons up at the back - Anna has an annoying habit of changing her outfit multiple times a day which means an enormous amount of washing for me to do, but she can't get those buttons un-done without help so chalk a minor win up for me! Believe or not but I had those giant pink buttons in the stash - my next door neighbour who works as a pattern designer for a fashion manufacturer here in Sydney gave me a big bag of buttons last time she offloaded some of her stash to me and these were in there. Perfect colour for the dress and perfect size for her dad to do up too - he's all thumbs sometimes! Unfortunately the first one broke my button foot on my machine, so I had to sew all the rest on by hand. Thank you all for your encouraging comments on the last post. I readily admit that I am quite hard on myself in terms of quality, but I do like my garments to look perfect and not at all home made. After 18 years of sewing I've moved beyond the stage of just being excited that I've made something that hasn't fallen apart to now being excited when something comes out perfectly executed. It's partly why I don't like sewing with knits so much - I feel like a newbie sewer all over again. It just goes to show that there's always something to learn, no matter how experienced or knowledgeable you are. Speaking of which, I'm attending a workshop on using the overlocker this Saturday with my local group of the Australian Sewing Guild which I'm thoroughly looking forward to. Last month I attended the industry day with the guild and not only did I learn loads about interfacing and sewing but I also had such fun, mainly thanks to the ladies I was sitting with making jokes and giggling all day like naughty schoolgirls (yes I mean you Sharon, Alison and Renata!). Plus I won a lucky door prize and scored a few metre of some new fangled interfacing recently released by McCalls which will come in handy for the winter jacket I'm going to make shortly now that my sewing mojo has returned. This dress is absolutely gorgeous! As is your little girl. Oh I hear you on the buttons and self changing problem! Cute dress - have fun at the workshop. The dress is beautiful and she's at the perfect age to sew for. I loved making my daughters dresses and outfits at this age - enjoy it because as I'm sure you're coming to realize it goes so fast! BTW, when are you moving? Just lovely, and isn't it nice that she likes you to sew for her. Adorable! And I cracked up about the buttons forcing her to stay in this dress, too funny! My sister changed outfits at least 5 times a day at that age. She just gets cuter :) I love that style of dress on younger girls, it looks so lovely. Now my girls are tweens/teens I'm struggling to find clothes that are both acceptable to them and age appropriate. Anna has managed to pick out a wonderful fabric for her new dress and next year the ruffle on the bottom may still make it wearable. Us naughty school girls, well! That girl has an eye for fashion, totally gorgeous. I hope when she gets to whatever age is appropriate that she wants to learn to sew. I will have to speak to my accomplices and try to behave more befitting our ages - NOT!! Naughty school girls indeed!!! Your daughter has her mother's eye for style. So hopefully she'll want to out do Mum with her sewing skills when she grows up a bit more. I say a bit because I can see her clamouring around your sewing machine before she's 10! Precious dress and little girl! I just love sewing for the little ones. Gosh Anna is growing up so quickly! She was born around the time I started back sewing and following your blog, so its a bit scary ;) She really is so cute and pretty in her lovely new dress and clearly it is a raging success. See you tomorrow. 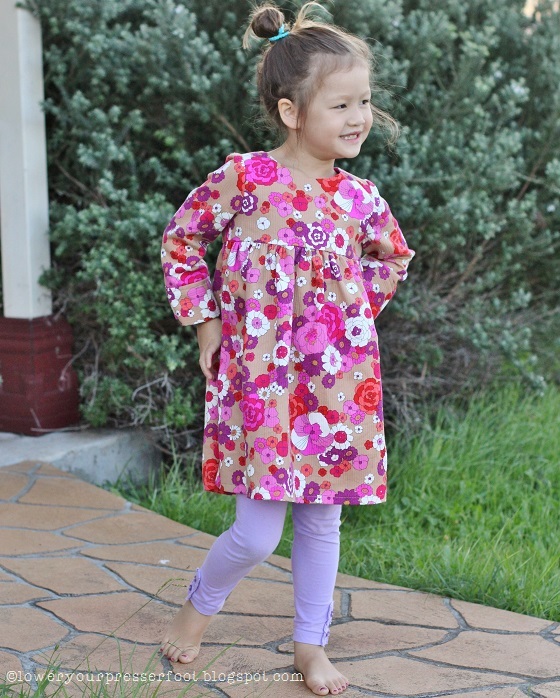 So cute to see Anna still loves to "twirl"... My granddaughter would probably love that fabric! Anything w/pink/purple is her new favorite! Lol... yeah, I remember those days of the constant clothes changing. Maybe you need to tell her you will only sew for her every other month or so. Think she would buy that? LoL..
Anna looks gorgeous in her dress. 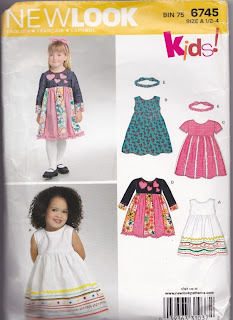 I used to love sewing for my daughter when she was that age. Once again I am labelled as naughty. Love it! She looks so sweet and happy in her new dress. I had to laugh at the buttoning at the back trick, I had a serial changer at that age too. Very tiresome with the washing! Thats so cute it melts my Grinchy heart!! Beautiful dress on your beautiful little girl. Love her twirls! So cute! She's definitely a mini model. It's great that kids love to have mom sew them clothes. My adult kids still love when I sew for them, it makes them feel special which they are. So so cute modeling her pretty dress. You better enjoy sewing for your self while you can. This advice is from mom of 3 now adult daughters. It gets worse if you sew what they like and pick out rather than what you'd like to make for them. You never get done with their projects. Lol!